Asteroid Day 2015: Bill Nye, The Rock Band Queen, "Solsbury Hill" And Near-Earth Objects Are All Related? What do Bill Nye (The Science Guy), Brian May (lead guitarist of the rock band Queen), Peter Gabriel and his "Sledgehammer" and asteroids have in common? 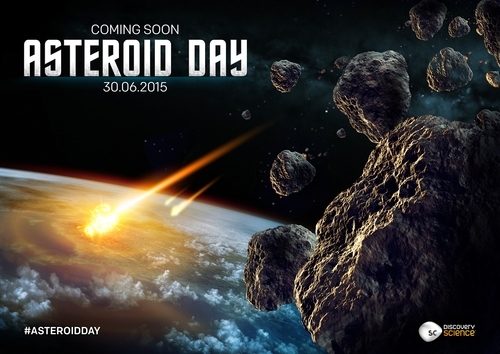 Asteroid Day 2015. "Asteroid Day, a global day of education and awareness about asteroids, is a growing international movement to learn what we can do to protect our planet, families, communities, and future generations from dangerous impacts. Organizers in London today announced the series of events to be held worldwide on June 30, the anniversary of the largest asteroid impact on Earth in recent history, the 1908 Siberian Tunguska asteroid Impact. "A full listing of Asteroid Day events can be found on the AsteroidDay.org website, including activities for the two premiere events in London and San Francisco. The film '51 Degrees North,' about a futuristic asteroid impact and its human ramifications, will premiere at London's Science Museum IMAX Theatre. At the California Academy of Sciences in San Francisco, the B612 Foundation and CalAcademy are hosting a full day of activities dedicated to education about asteroids, including films; presentations from scientists, filmmakers and astronauts; and hands-on activities for children. Regional events have been locally organized in Austria, Brazil, Bulgaria, Canada, Czech Republic, Germany, Greece, India, Italy, Korea, Mexico, Poland, Romania, Russia, Serbia, Spain, and Turkey, among other locations. Live webcasts from San Francisco, London and other locations will also be available online throughout the day at AsteroidDay.org. "'Early warning is the sine qua non of planetary defense,' said Rusty Schweickart, Apollo 9 astronaut, founder of the Association of Space Explorers (ASE), and chair of the Asteroid Day Expert Panel. 'Time is an issue. At the current rate of discovery of 20-meter NEOs and larger at about 1,000/year, it will take more than 1,000 years to find one million NEOs that potentially threaten Earth. That's a long time, and even then we'd have reached only 10% or so of the Chelyabinsk-size objects that potentially threaten impact. By signing the 100x Declaration, the public will join us in calling for increasing our asteroid discovery rate to 100,000 (or 100x) per year within the next 10 years. We've simply got to get at it!'" To read more about near-Earth objects and how NASA plans to keep Earth safe, check out HNGN's exclusive interview with John L. Remo, an astrophysicist who is currently working on asteroid and comet research in relation to potential impacts on Earth.